Though the aesthetic results of conservation treatments are extremely important, conservators are equally preoccupied with the stability of vulnerable objects on a level not always apparent to the naked eye. Making treatment decisions involves considering an object not just as a culturally significant or artistic work, but also as a specimen undergoing chemical changes. 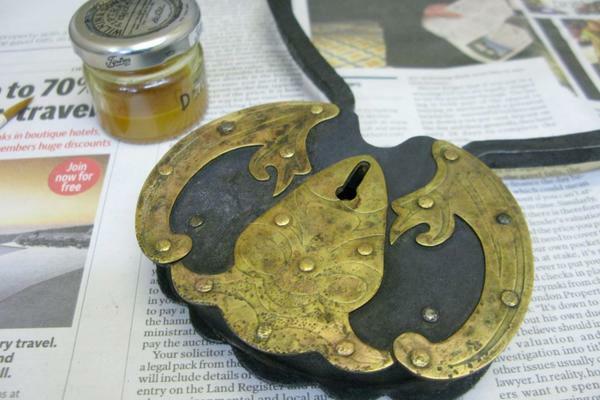 For example, the mild steel and brass padlock that I described making in a previous post was in desperate need of care, after having been subjected to an outdoor environment for three weeks and sprayed daily with salt water. 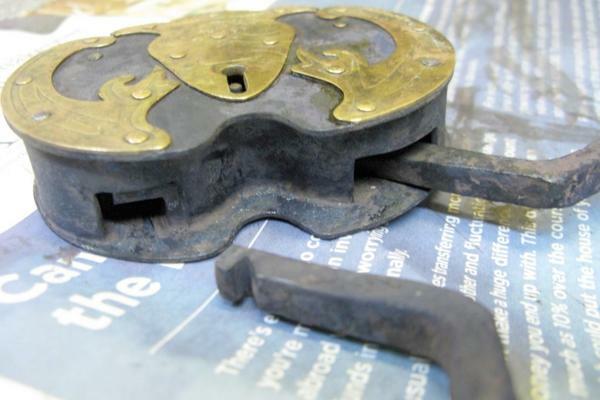 Before I dealt with aesthetic issues, I needed to do two things to keep the padlock from deteriorating further: desalinate to halt active corrosion and remove unstable oxides that would accelerate future corrosion. Table salt ionizes in water to give Na+ and Cl- (also called chloride). Chloride is very electronegative, which means that it tends to attract electrons to itself from surrounding materials. Metals are electropositive, meaning they are composed of elements that don't hold their electrons as tightly, and easily give them up. This loss of electrons is a chemical reaction called oxidation, resulting in corrosion products on the surface of the metals. 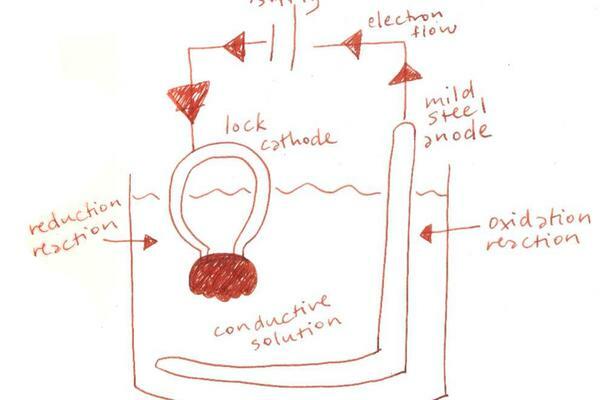 Desalination of the padlock was necessary because the presence of chlorides created an environment in which metal electrons were given up more rapidly and therefore increased the rate and likelihood of future corrosion. The lock was washed with a soft bristle brush in tubs of water, which were changed after every ten minutes of thorough washing. The conductivity of each tub of water was measured before and after every wash. The higher the conductivity, the more chlorides were present in the water. 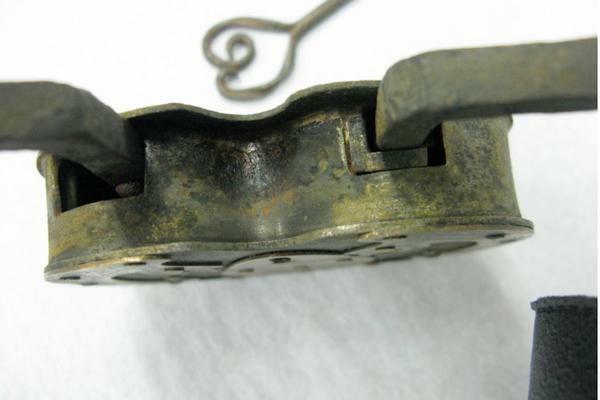 When conductivity readings for pre- and post-wash water were equivalent, it indicated that chlorides were no longer being rinsed off the padlock. After changing the water three times, the conductivity data showed that the lock was fully desalinated. I then used acetone to dehydrate the padlock, so that a flash corrosion process wouldn't be set off by residual moisture. At this point, the padlock was still covered in red and orange corrosion products, but it was already more chemically stable than when I first brought it indoors. For the removal of unstable hydrated oxides, I weighed the pros and cons of various mechanical and chemical cleaning techniques. I settled on using electrolytic reduction, which would convert the active corrosion product on the mild steel (ferric oxide or Fe2O3) into the more stable magnetite (Fe3O4). This method was chosen due to its effectiveness in reaching difficult to access areas and simplicity in setup. Electrolysis is the process by which negatively-charged ions from a positively-charged anode are transferred to a metal object (the cathode) through the application of an electrical current in a conductive solution. Reduction occurs at the cathode and corrosion particles are transformed into a metallic state, consolidating the corrosion layer so the object may be mechanically cleaned. An additional benefit of this process is that chlorides on the object also move to the anode via electrolytic attraction. Even though I had already desalinated the padlock, this bonus feature would whisk away any chlorides I might have missed. My only concern was how the brass escutcheon on the padlock would handle this kind of chemical cleaning. 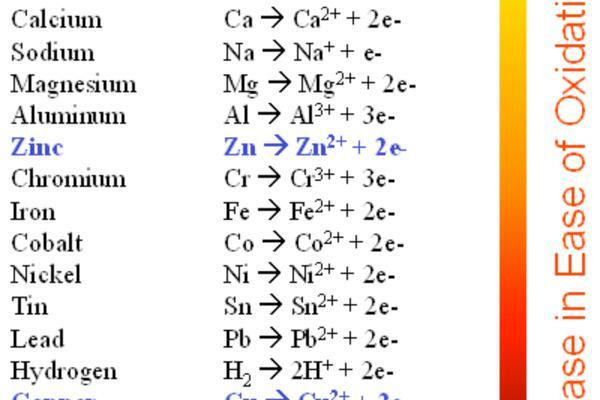 From looking at the activity series of metals, I knew that zinc is less stable than iron when undergoing electrolytic reduction. Therefore, it would be preferentially removed from brass (an alloy of zinc and copper), leaving a pink copper-rich surface. The activity series is a chart that displays the reactivity of all metals on the periodic table, with most easily oxidized at the top descending to the least easily oxidized at the bottom. Oxidation occurs when a metal loses electrons, becoming a cation (positive ion) and reduction occurs when metals gain electrons and becomes an anion (negative ion). Tests were done to figure out the ideal electrical voltage and amp settings to minimize the danger of zinc depletion on the escutcheon. The electrolytic cell was set up in the fume cupboard, to draw away the hydrogen gas that formed during the process. 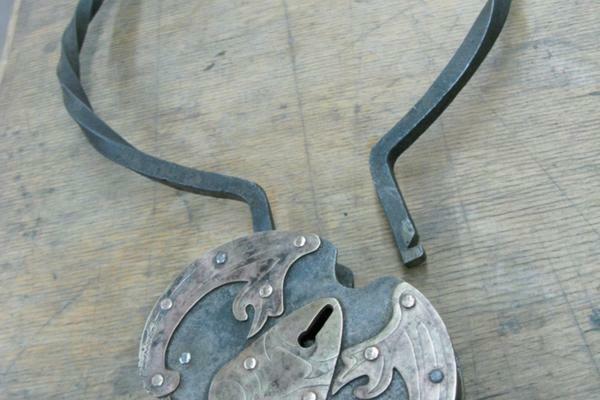 The parts of the padlock closest to the sheet steel anode are more effectively treated, so the lock was turned several times during electrolysis to ensure consistent exposure. After fifteen minutes of treatment at a voltage of 4.8 and amp of 0.8, I checked the padlock for progress. Some of the ferric oxide had already converted to magnetite in that time and there was no zinc depletion visible. In all, the padlock underwent electrolysis for a total of 1 ½ hours. I constantly monitored the state of the brass escutcheon during this time. After electrolysis, the lock was again rinsed in acetone to remove residual moisture. 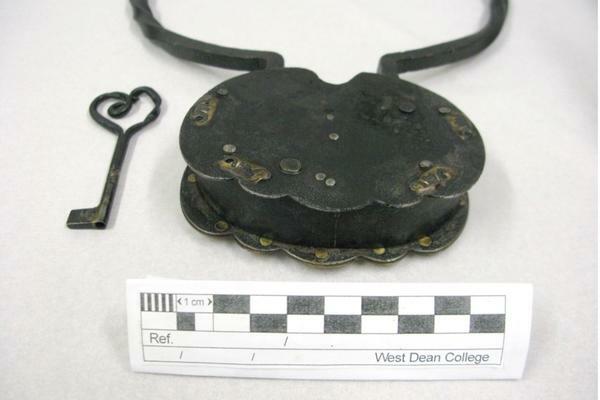 These following pictures show the padlock at this point. 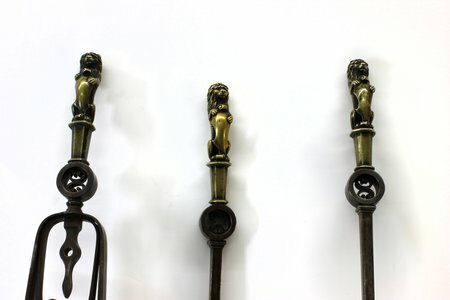 A brass brush, fine grade 0000 wire wool swabs and IMS were used to mechanically remove corrosion from the brass components and the powdery magnetite left on the mild steel. While this dark oxide does not undermine the stability of steel like its orange cousin ferric oxide, its patchy coverage obscured the original surface and did nothing to enhance the metal's ability to resist corrosion. A substance that does provide this kind of protection for ferrous metals is tannic acid, which converts corrosion products to a more moisture-resistant ferric tannate. In addition to stabilizing the metal substrate, the ferric tannate imparts a dark blue-black colour to the treated metal, which can be suitable for some objects. 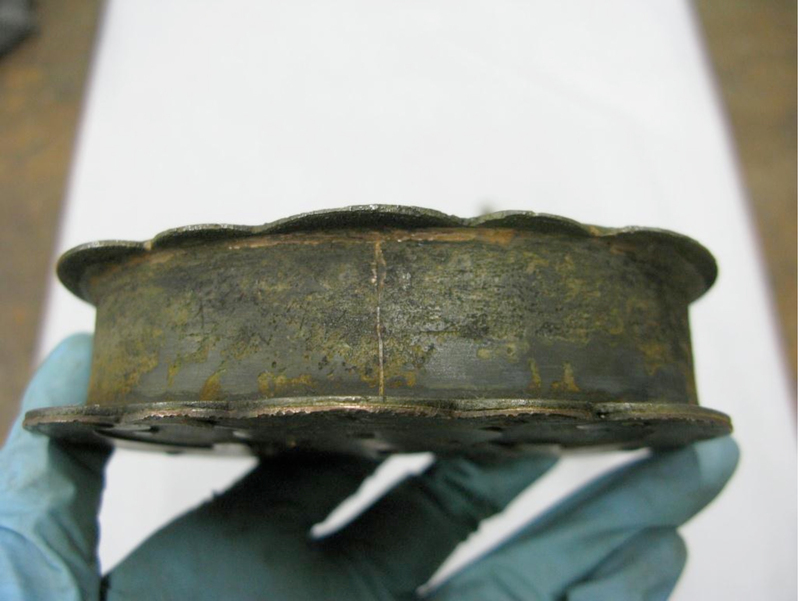 Obviously, tannic acid should not be used on objects where the composition of the corrosion is of aesthetic, structural, or research importance, such as archaeological artifacts. My padlock, however, benefitted both aesthetically and structurally from the application of three layers of 5% tannic acid solution. 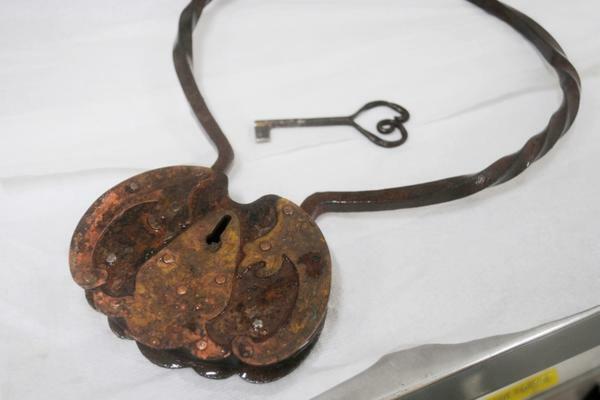 Tannic acid was also poured inside the lock casing, swirled around to cover the interior and mechanism components, and poured out again. 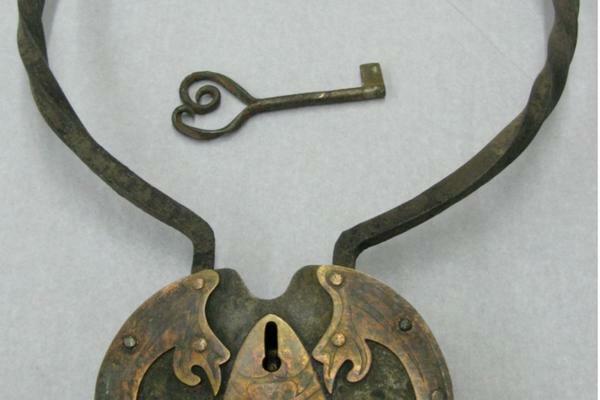 The padlock now looks more readable as a mechanical art object and more obviously "conserved," but the visual results are very much the consequences of science-based decision making. 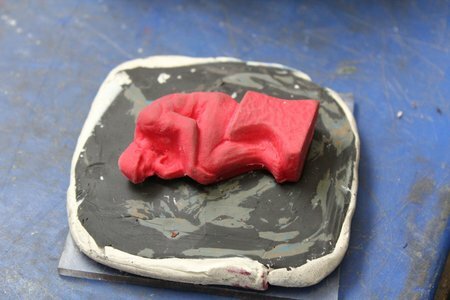 Much of the treatment process was aimed at stabilizing and protecting the object on a molecular level. It is fortunate that the ways to stabilize and protect objects often coincide with aesthetically pleasing side effects!